From an auto repair shop at one end of the street to a movie theater and a building under construction at the other this book depicts downtown USA during the Great Depression through the eyes of 29 of North America's top caricature carvers. 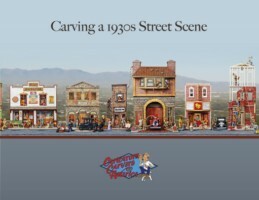 The Caricature Carvers of America (CCA) present the 1930s street scene complete with 11 buildings and over 100 original caricature carvings. In their newest project CCA members offer their approach to developing ideas building models carving painting and finishing techniques through photos patterns and text. The book includes a step-by-step chapter on carving a piece from the scene as well as patterns and details for many of the original carvings.